Looking for HubSpot nerds with the experience to back it up? 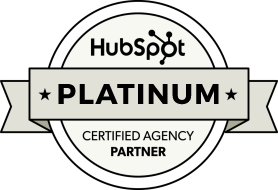 So - what exactly does "HubSpot Platinum Partner" mean? It means we are trusted by business leaders and teams to help solve strategic and technical business problems via HubSpot. In turn, allowing you to get the most out of this invaluable tool for your business. You & Co is a small, "secret sauce" agency that offers truly personal service with two studios based in Sydney and Brisbane. We enjoy helping forward thinking, sales hungry organisations to achieve their goals. Does that sound like you? Our team of Designers, Developers, Marketers and Sales enthusiasts are certified in most, if not all HubSpot certifications. See just a handful of our certifications below. "You & Co are an exciting team to watch. Their style of inbound comes with a strong commitment to solving broader business problems, finding solutions that drive impact and create meaningful outcomes for their customers." What are you looking to do with HubSpot? Looking to expand your marketing reach, hone in on a target customer and provide value along your funnel to boost conversions? Finding yourself with leads and want to maximise the HubSpot tool to help manage leads into deals and ultimately paying customers? Take 5 minutes to audit your HubSpot portal.